Slapstick comedy, funny or not, the intrigue of this style of humour lies not so much in it's ability to arouse laughter but in it's ability to spark electrifying controversy (positive and negative) among charged comedy critics. The standing of slapstick comedy is often vertically debated by comedy critics. Whether it should elevated to an actual art form or lowered to a subordinate stature has only served to heighten the debate and bring it to the zenith of comedic discourse. The flavour of the argument has often been polarised by those who find high brow or low brow comedy more palatable, despite that this has always been a matter of taste. These critical humourist's appetite is never satiated by simply experiencing the joy of someone getting a pie in the face, and they relish the moment they can again chew on a tasty morsel of debate as to whether this constitutes laughter in it's purest form or degradation masquerading hilarity. This has always been a bone of contention for me as I consider the entire argument to be half-baked. Some argue that it does not even belong in the category of "low brow" and should more rightly be placed in the realm of the protruding brow as archeological evidence does show that Neanderthals did use wooden tools on each other for amusement. 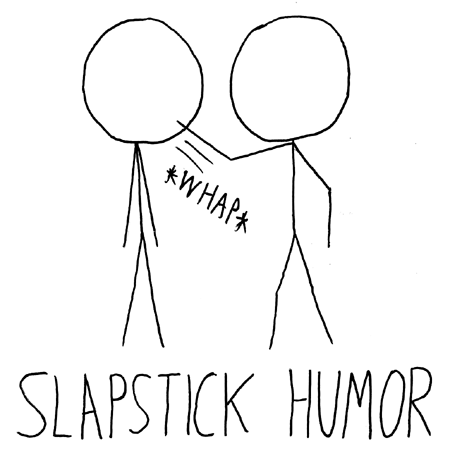 "slapstick." It comes from the word batacchio which is the sound an Italian person makes when they are struck with two wooden slats fixed together. There was much experimentation in the early days but ultimately it was found the hitting Italian people produced the funniest results by far. Thus the batacchio or "slapstick" was named. Ultimately this debate will rage on as to whether slapstick comedy constitutes genuine comedic practice or not, however I am sick of this debate and hope an anvil falls on the head of those who take comedy too seriously to enjoy people getting physically injured.